Last week I spent a wonderful few hours visiting my pal Flora Jamieson in her studio in Bridport. 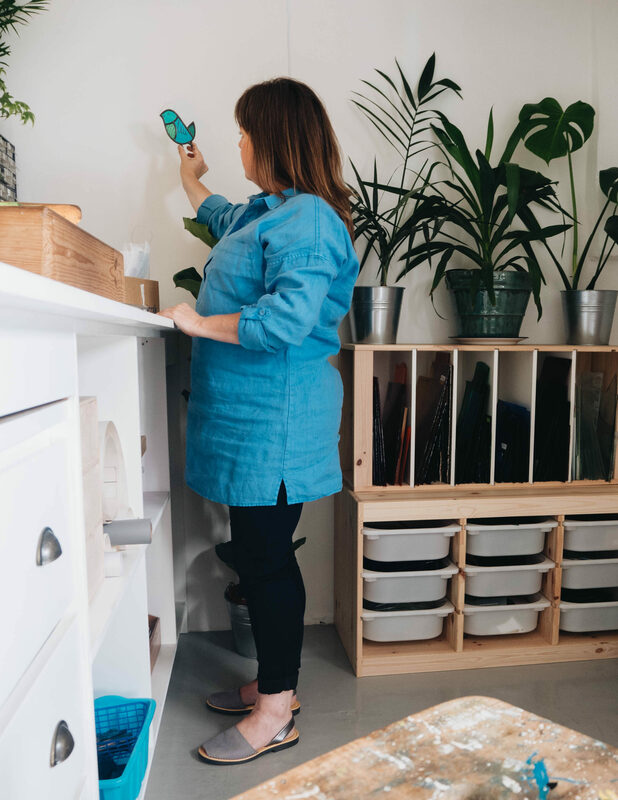 After having seen her home on Instagram for many years it was an absolute treat to be sitting in her kitchen drinking coffee and looking at her beautiful space. 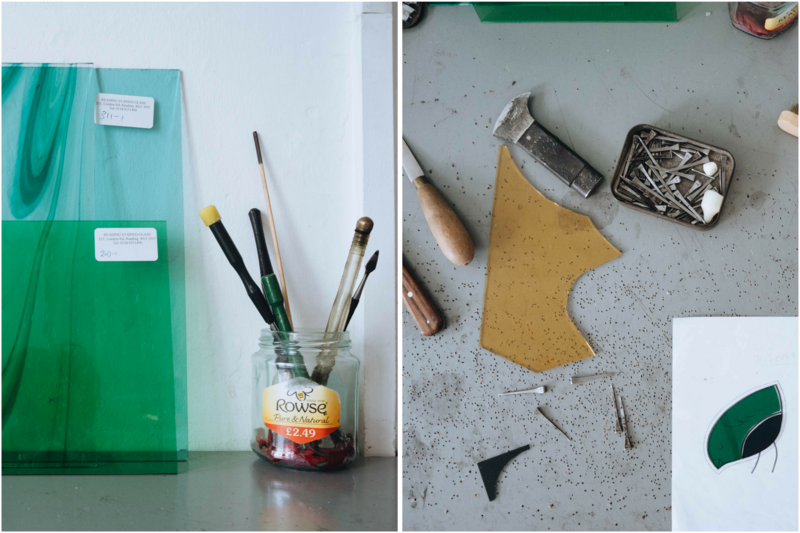 Flora Jamieson has been designing and making stained glass for 20 years. 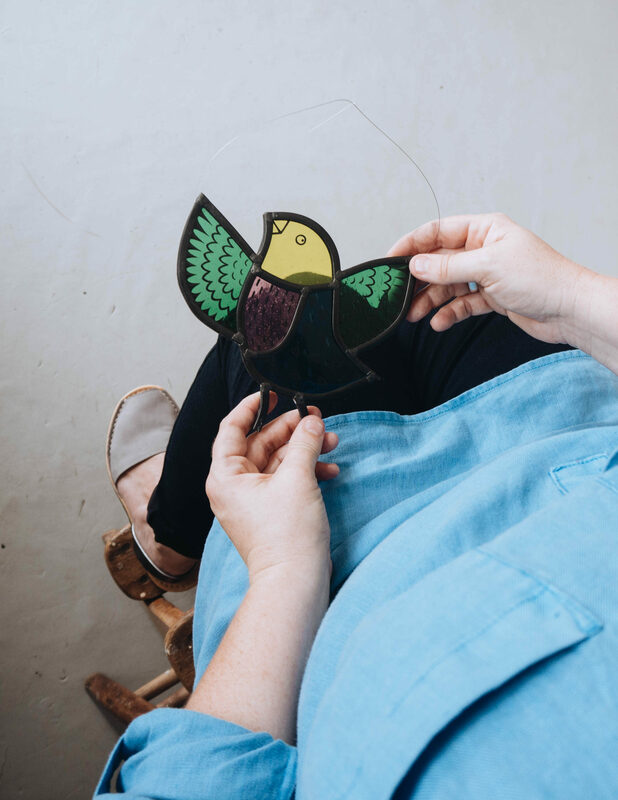 She makes contemporary decorative windows, panels and free-hanging stained glass pieces, which she sells online and in selected shops and galleries. 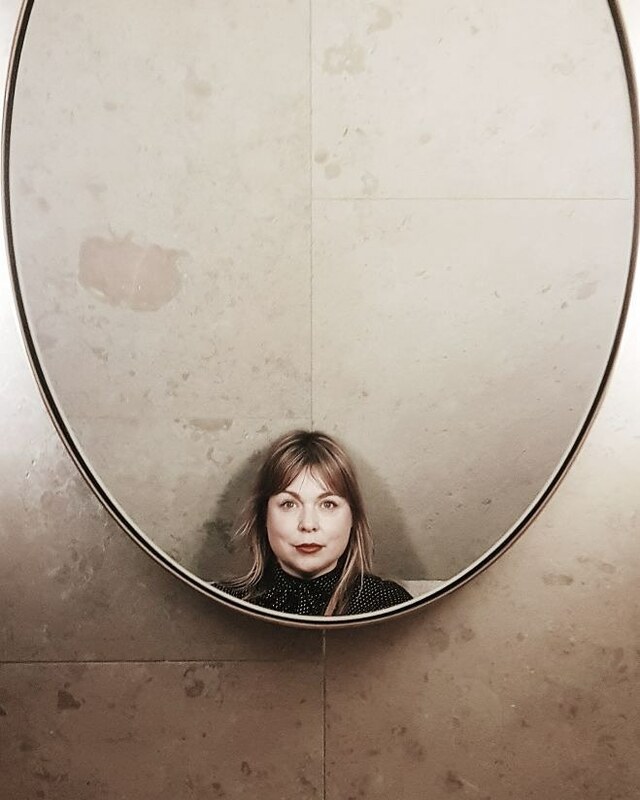 Her own designs are inspired by 1960s & 70s graphic design, vintage wallpaper and textile designs, the natural world and random and geometric patterns. 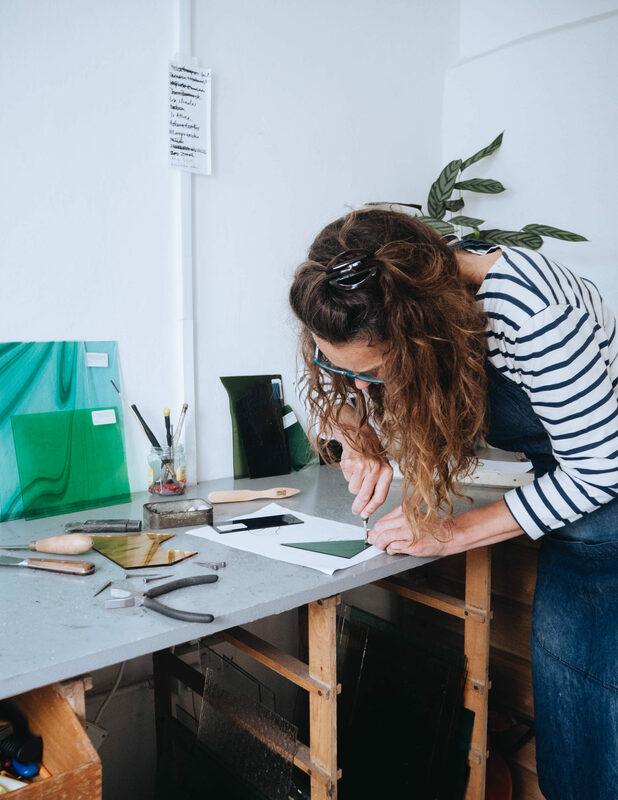 She also specialises in recreating and restoring Victorian hand-painted stained glass windows (for private homes, public buildings and the church) and works as a freelance glass painter for other studios around the UK. Stepping into her studio I was in awe of her delicate work, painting detailed sparrows onto glass using high pigment glass paint. 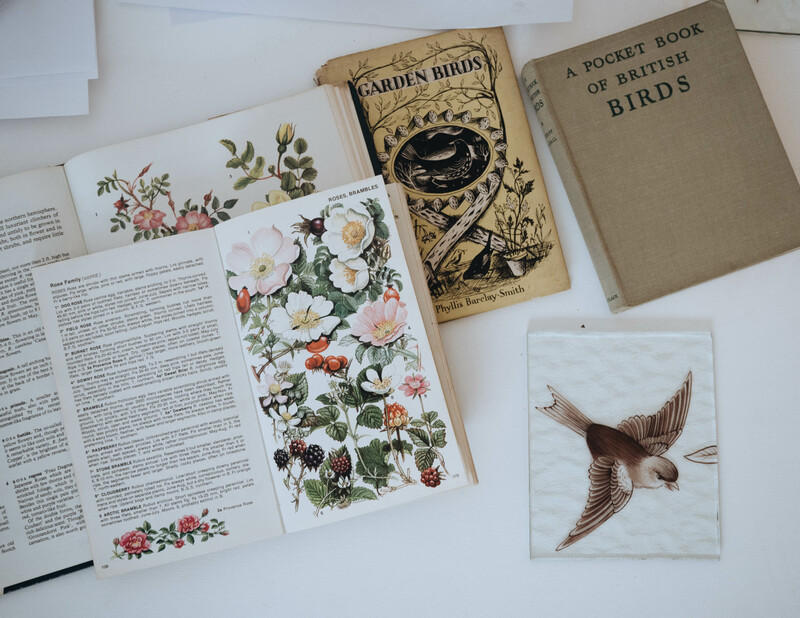 On her desk, Flora had open vintage nature books, with pictures of birds, wild flowers, dog roses and more to help her in recreating the restoration piece. Using the handmade light box, she showed us how she builds up the layers of painting, by using a sketch placed under the glass as a template, and then intricately painting the image onto the glass. 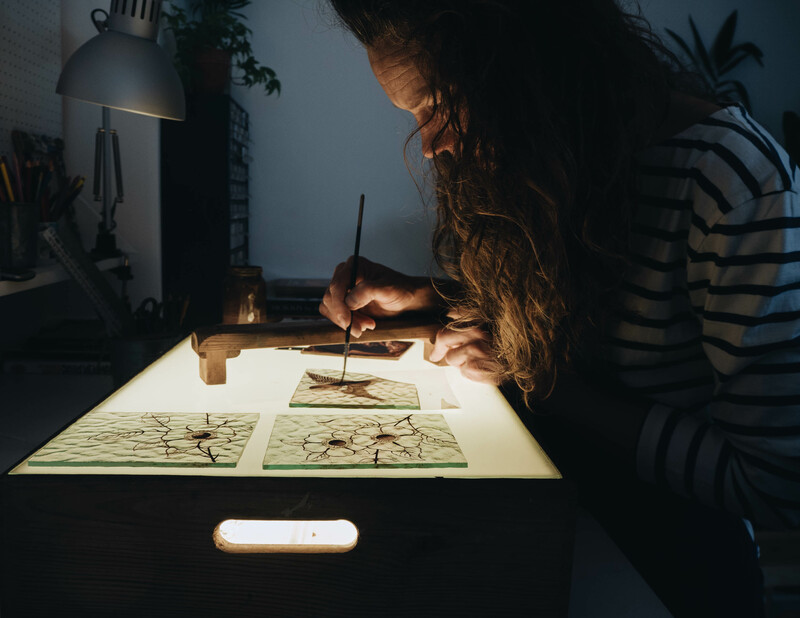 Flora painting on glass using her handmade lightbox. Once the paint had been applied, it would then spend a few hours in the kiln in the next door studio to harden, before any coloured paint is added. 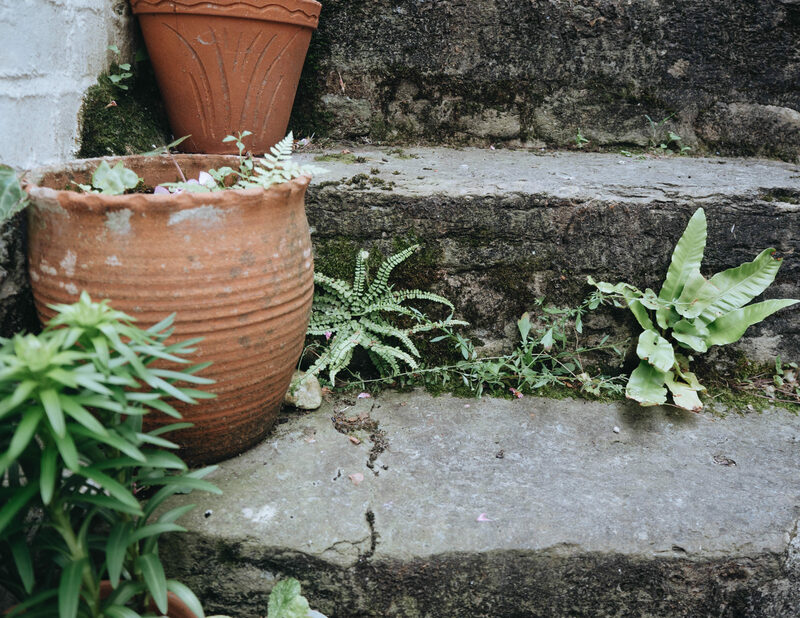 Flora’s studio is across the alley from her home, a mere two steps door to door. 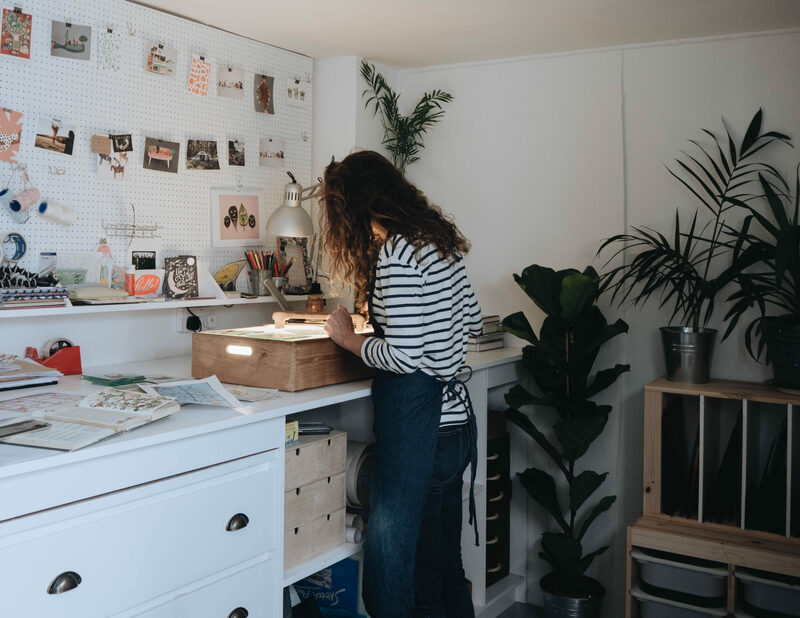 Looking around Flora’s studio, I was inspired by not only her work, but her own sources of inspiration pinned to the white peg board. Postcards from her favourite artists, images from Sisterhood Camp, photographs of her daughters playing in a river. Plus, of course, masses of plant life – just look at that fiddle fig leaf!! Flora also creates her own glass pieces for sale, and recently had an exhibition in Gloucestershire where she hung a flock of colourful birds, flying. Her work can be seen in galleries around the country and can be bought in her online shop. Flo showed me how she makes her beautiful birds. Using a template she scores the shape into the glass and taps the glass to break. Next lengths of lead are shaped around the glass and kept in place with farriers nails before she solders it all into place. Such a satisfying process, cutting, hammering, painting and soldering. Age old techniques still being used today. I have been friends with Flora for about five years now, mainly an online blogging/instagram friendship – meeting up in real life a few times. Most recently at Sisterhood Camp in June. At this years retreat Flo led a special workshop, telling us all about her love of wild swimming and the benefits she gets from the first plunge into the icy cold water of the sea or river. Revved up with inspiration, the sisters wandered through the woodland to the banks of the Teifi River and to then leapt in the deep dark water. Bonding, invigorating and life affirming. It was truly an experience I will never forget. 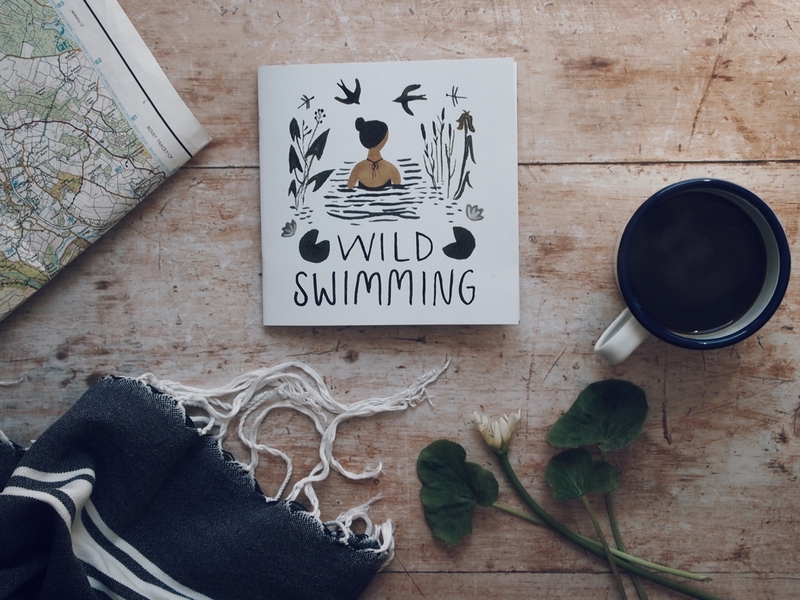 Flora has collaborated with artist Gemma Koomen to create a wild swimming handbook. Written by Flora and illustrated by Gemma. It contains practical advice and safety tips, as well as inspiring quotes and useful resources, it is a guide for those wishing to dip their toe into the glorious pursuit of wild swimming in lakes, rivers, pools, waterfalls and sea. I treasure my copy, and can’t wait to get swimming this summer. 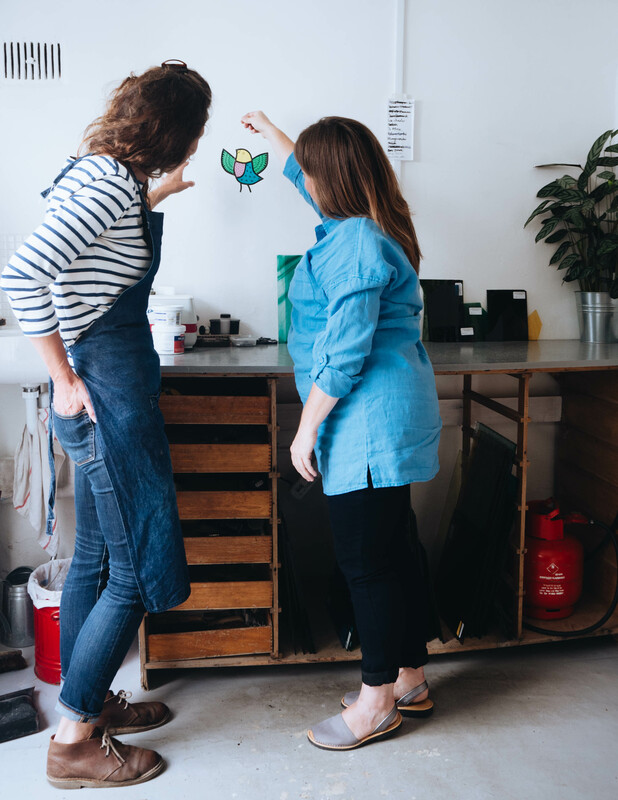 Thank you Flora for showing us around your studio and sharing the process behind your beautiful work. 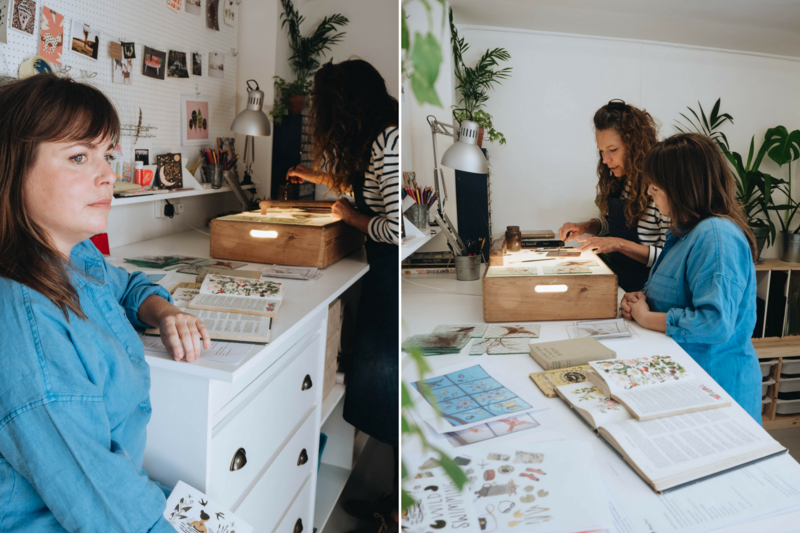 Collaboration Note: This post was written as part of an ongoing ambassadorship with Seasalt Cornwall. 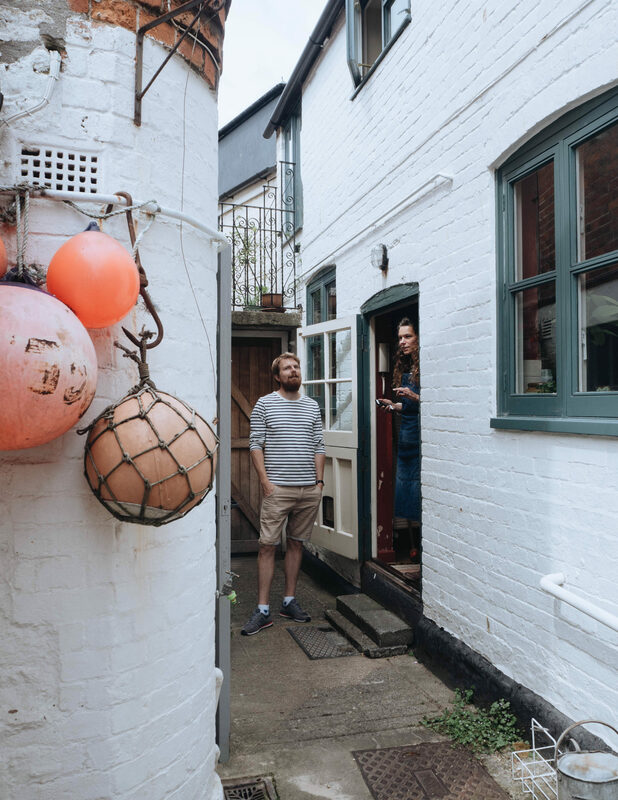 This season Seasalt are celebrating thriving artistic communities, and strong female artists such as Dod Procter, Wilhelmina Barns-Graham and Sandra Blow. The July collection is bursting with energy and colour, inspired by impressionistic scenes of summer. All words are by Lou Archell – Images by Dan Taylor. What a cool art medium to work with! 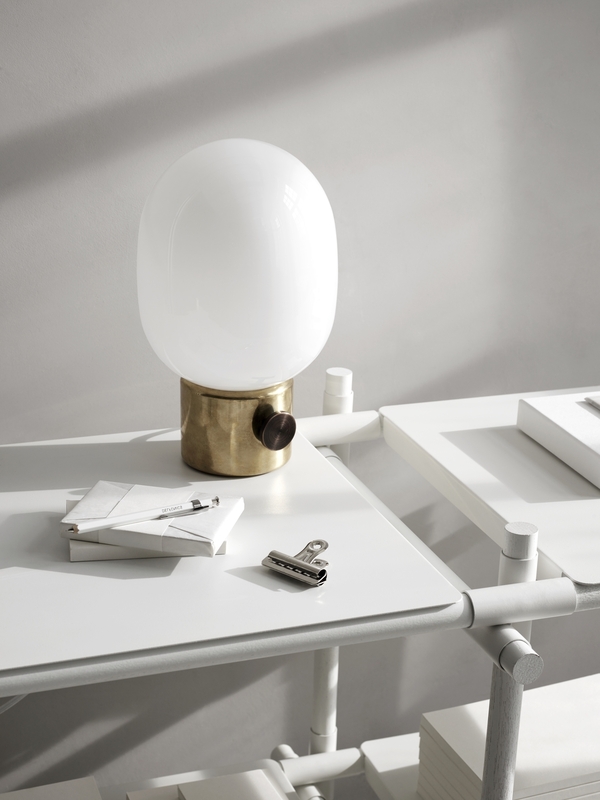 I love seeing classic forms of craftmanship being used for modern pieces, it’s so refreshing. I’ve just come across your blog and your content is amazing, I love it! I’m off to go grab a cuppa and delve into your archives, hehe!